We're pleased to offer our free industrial energy savings guide! Based on real-world results, this guide offers practical and proven energy saving tips. Complete the form below to download your copy of this helpful guide. Although it may seem straight-forward, the consumption of electricity by manufacturing machines may not always track with production activities. Physical measurements of power-use during the work day can help you understand the relationship between electricity consumption at your facility and your production activities. Since manufacturing facilities are so diverse, the same machine in two different manufacturing facilities can have very different energy operating costs. Learning the details of this relationship can go a long way toward reducing electricity costs. Detailed examples are described in this section. 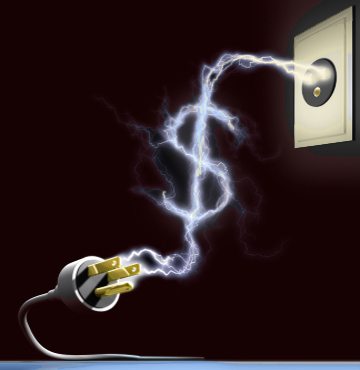 Are You Paying Too Much Trying to Save Money on Your Electricity Bill? It is well known that you can't fix a problem until you know what the problem is. But, in some cases it just costs too much to determine where the power is being used at a facility. Smart-meters, smart-buildings, smart-grid, and smart building automation systems are just a few of the "buzz-words" swirling around these days -- and all represent technology options to help you get a better handle on the important question "where are my electricity dollars going?" But, a key question is - "How much will it cost to find-out how we are spending money on electricity to run our machines?" Not all power monitoring solutions are the same. Some monitor power-use and power-quality, others just one or the other. If you want to focus on reducing your electricity bill, it may be adequate to focus on tracking your power-usage and leave the power quality issues for another day. Should I Monitor the Whole Plant or Individual Equipment Power Use? A question often asked by our customers relates to the recommended strategy to save the most money on their electric bill. Specifically, the question most often asked is " ... to save the most money, would it be better to continuously monitor all the power coming into our plant or to monitor individual pieces of equipment connected to power distribution panels scattered throughout our facility. In many cases, monitoring individual equipment gives you better insights into saving money. As is usually the case with these types of decisions, there are lots of engineering trade-offs and no simple, always correct answer, but here are some guidelines that we used to reach our answer. Many of these issues may apply to your situation. Although these guidelines are not perfect, they may help you select the best approach for your needs. 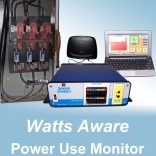 A "power-use" monitoring system can help you identify costs associated with various pieces of production and support equipment - such as extrusion machines, air compressors, pumps, mixers, heat treatment ovens, and HVAC equipment. The total power consumed by any single machine in a "typical" week will depend greatly on the details of your week. Physical measurements are needed due to the duty cycle variations associated with production loads, environment changes, operator issues, shift issues, and many, many other factors.